Last month fresh figs were on offer at my local supermarket - less than half price - and I couldn't resist. However, I then spent what I'd saved (and some more) on blue cheese to try and recreate a dish I'd had in a lovely restaurant a few year ago. I remembered it being figs cooked with blue cheese, but I have no idea what accompanied it so I made up my own dish, and experimented on the hubby. Although not juicy, a fig is soft inside and has an incredible sweet flavour and lovely smell. Kind of oval in shape, the purple fruit is delicate and requires gentle handling, and is delicious when cooked. You can also buy them dried, which is how I bought them in the past, mainly to use at Christmas in puddings. Fresh they are available from late summer to late autumn. When buying pick ones that are plump and soft but not split. To prepare gently wipe the skins with a damp cloth, trim off the stem if it's hard. Then they are ready to use. For this recipe, first I quartered the figs, stuffed them with blue cheese and put them in the oven on a medium heat for about 10 minutes. For two of us, I used four figs. Whilst they were cooking, I chopped some spring onions, pak choi, mushroom, red pepper and garlic and then stir-fried this in coconut oil, added a splash of soy sauce, a handful of nuts (hazelnuts, walnuts and cashew nuts) and some seeds (chia, linseed, pumpkin & sunflower for a few minutes on a high heat. All things I had in the fridge or store cupboard. 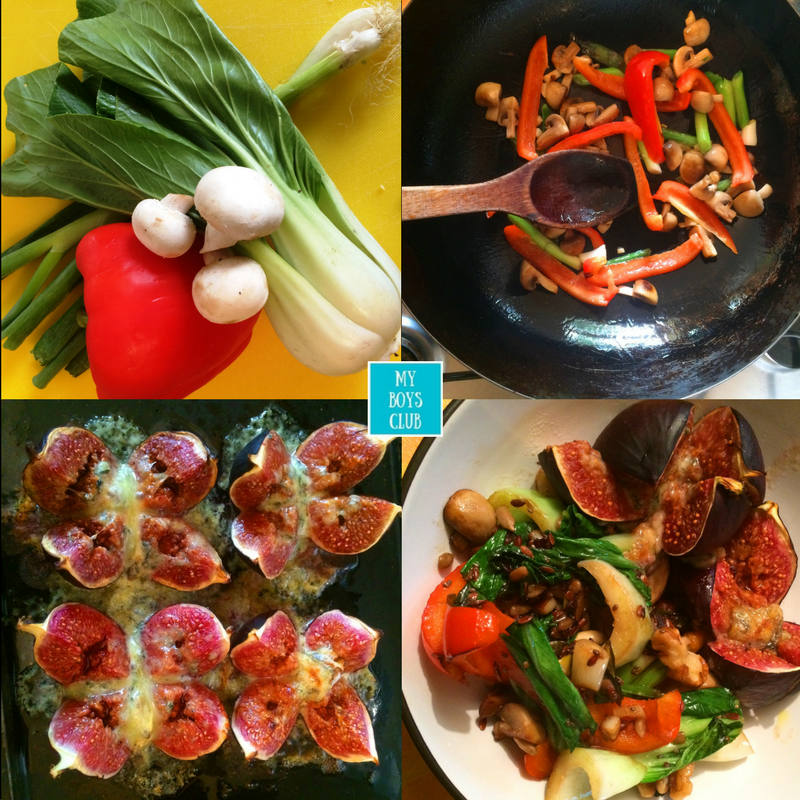 Once the cheese had melted, the figs were served alongside the stir-fried vegetables and some wholemeal bread. Time: 15 Mins to prepare and cook. 5 mins to eat. Boys Club Rating: Quick and easy and it was as tasty as I'd remembered. Hubby said "actually that's pretty nice" (and that's from someone who doesn't like blue cheese) "I'd eat it again". 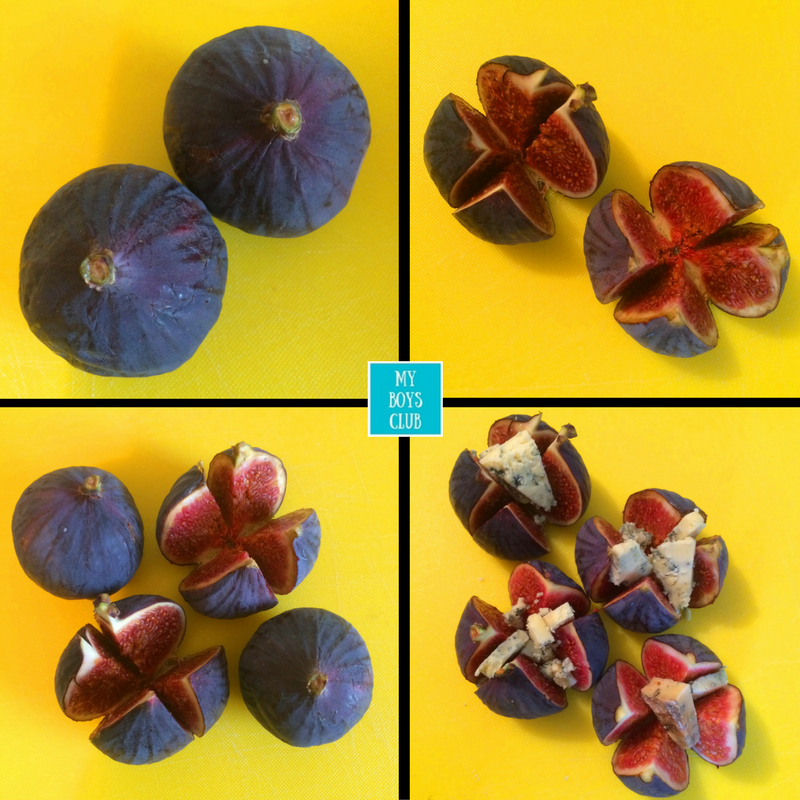 Have you tried cooking with fresh figs? Oh my never have I ever had Figs before and don't think I would ever try it. I mean if maybe I didn't know it was it something like cut up really tiny then maybe, yeah. My husband likes to try everything new so he would probably like this dish. Don't get me wrong other stuff in the recipe looks good. Thanks - it really is. Will definitely be cooking it again. Ooooh yum! Have you tried it goat cheese or feta? I love goat cheese. 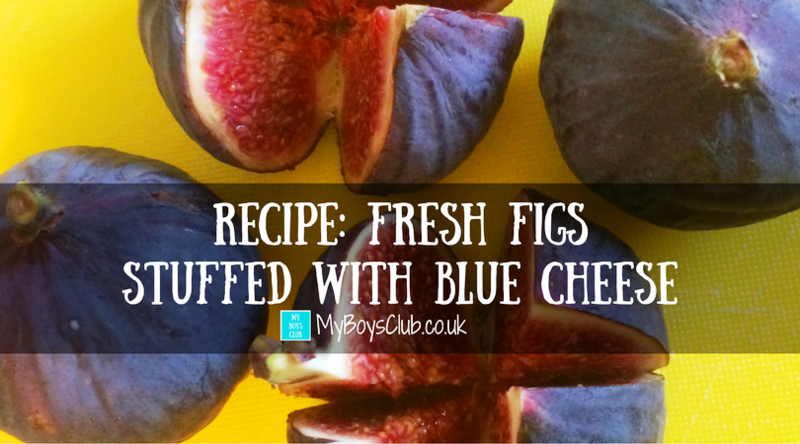 I'm not big into blue cheese because of it's strong flavor, but I bet the figs counteract it and make this taste delicious! Yes it does but you can use any cheese to your liking too.